There is currently just the 1 ferry route running between Jersey and Sark operated by 1 ferry company – Manche Iles Express. The Jersey (St Helier) to Sark ferry crossing operates weekly with a scheduled sailing duration from about 1 hour 10 minutes. Whilst we’ve taken great care to ensure the information on this page is correct, as the frequency and duration of crossings on all routes can vary from time to time we’d advise that you get a live quote for current availability on this Jersey Sark crossing between Jersey (St Helier) and Sark. Jersey, the largest of the Channel Islands, is a British Crown dependency found just off the coast of Normandy in France. Reaching 9 miles long and 5 miles wide, it has a wealth of beaches and coastline activities on offer. The north and east coasts are scattered with rock pools ideal for children, whilst the south and west are lined by golden sandy beaches with bright blue waters worthy of the Mediterranean. 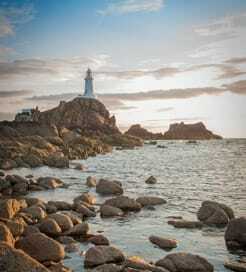 However, Jersey is far more than just seaside fun, with plenty of fascinating landmarks and historical sites waiting to be explored including a ruinous 14th Century castle and Britain’s first concrete lighthouse. For a relatively small island, Jersey provides a wide range of ferry services from its port in St Helier on the south coast. You can sail to the other Channel Islands, northern France and the south coast of England, with a selection of ferry operators to choose from. Sark is the fourth smallest of the Channel Islands, part of the Bailiwick of Guernsey, located just off the Normandy coast. 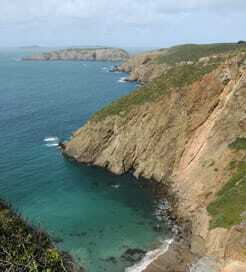 A holiday in Sark is like stepping back in time. This traffic-free paradise has no cars, only tractors, bikes, horses and carriages are used to get around the island, posing a dramatic effect on the relaxed pace of life on the island. Also recognised for being sufficiently clear of light pollution, Sark was designated the first Dark Sky Island community in the world.